Universal Pictures invited ComingSoon.net to the New York premiere of Jordan Peele’s Us, his follow-up to the Oscar-winning Get Out, and now that we’ve seen the film we wanted to give our readers a little NON-SPOILER assist for a major real-life event that informs the film: Hands Across America. What was Hands Across America? Find out below before you see Us this weekend, and check out photos in our special gallery! 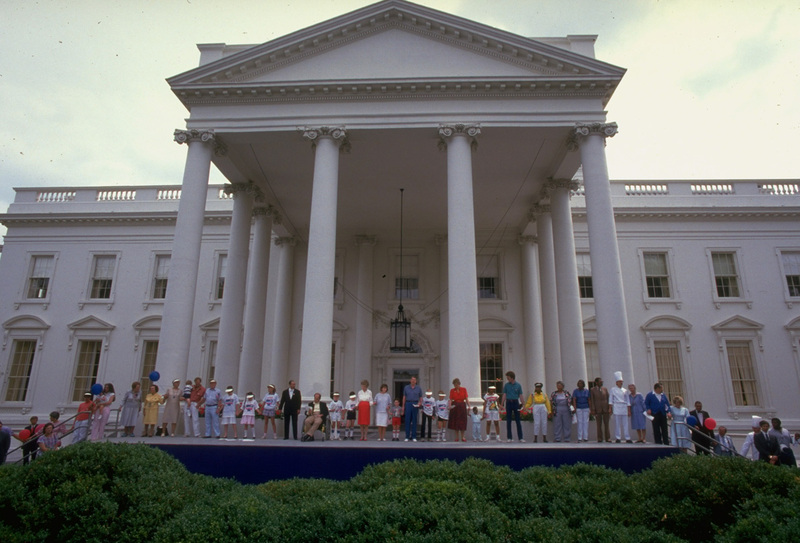 The very first scene in Us features a commercial for Hands Across America on a vintage TV circa 1986 when the opening takes place. Since Peele is showing this to us right upfront it stands that it is going to be important to the plot, correct? Well it would certainly help to know what it was in order to understand the reference. Hands Across America was a charitable fundraising event which took place on Sunday, May 25, 1986 in which 6.5 million people held hands for fifteen minutes to form a human chain across the United States. The benefit raised $34 million dollars to fight hunger and homelessness in America, although only $15 million was given out after costs were deducted. Participants were invited to spend $10 dollars to reserve their place in the line. In more heavily populated areas like major cities the lines were 10-people-deep, whereas in more sparse towns or desert areas there were huge gaps. The event has since become both a fond bit of 80’s nostalgia and occasionally a punchline on sitcoms like The Simpsons, Modern Family, The Goldbergs and the movie Beerfest. 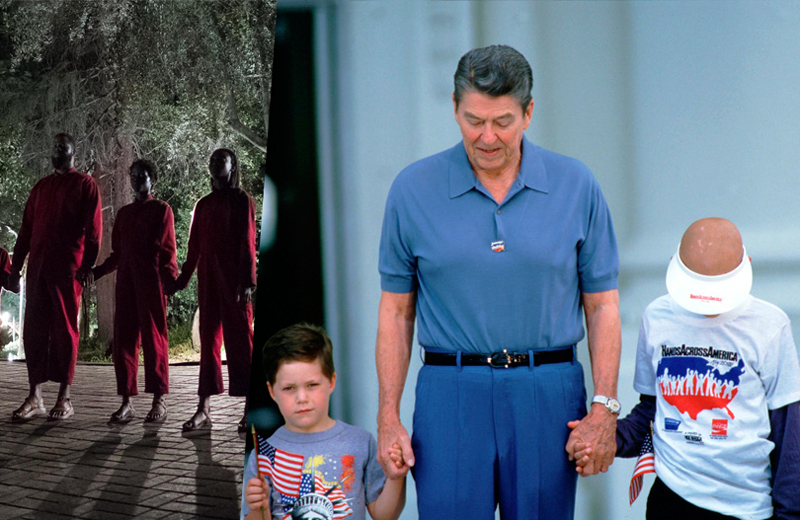 A good many 80’s celebrities participated in Hands Across America to help raise awareness, including President Ronald Reagan, Michael Jackson, Michael J. Fox, Liza Minnelli, Jerry Lewis, Scott Baio, Tony Danza, Brooke Shields, Gregory Hines, Edward James Olmos, Yoko Ono, Jamie Farr, David Copperfield, Kathleen Turner, Kenny Rogers, Bob Seger, George Burns, Dudley Moore, Richard Dreyfuss, Donna Mills, Robin Williams, Don Johnson and -yes- R2-D2, C-3PO and Chewbacca. RELATED: First Reactions To Jordan Peele’s Us Are Glowing! Us stars Lupita Nyong’o (Black Panther), Winston Duke (Black Panther), Elisabeth Moss (The Handmaid’s Tale) and Tim Heidecker (Ant-Man and the Wasp) along with Shahadi Wright Joseph (Hairspray Live! ), Evan Alex (Mani), Madison Curry, Cali Sheldon, Noelle Sheldon (Friends) and Duke Nicholson. Set in present day along the iconic Northern California coastline, Nyong’o stars as Adelaide Wilson, a woman returning to her beachside childhood home with her husband, Gabe (Duke), and their two children (Joseph, Alex) for an idyllic summer getaway. Haunted by an unexplainable and unresolved trauma from her past and compounded by a string of eerie coincidences, Adelaide feels her paranoia elevate to high-alert as she grows increasingly certain that something bad is about to befall her family. After spending a tense beach day with their friends, the Tylers (Moss, Heidecker, Cali and Noelle Sheldon), Adelaide and her family return to their vacation home to discover the silhouettes of four figures standing in their driveway. Us pits an ordinary American family against a terrifying and uncanny opponent: doppelgängers of themselves. Us will be written and directed by Peele and will also produce through his Monkeypaw Productions. The film is being produced by Sean McKittrick, Jason Blum and Monkeypaw’s Ian Cooper with Daniel Lupi to executive produce. The film will hit theaters wide on March 22.